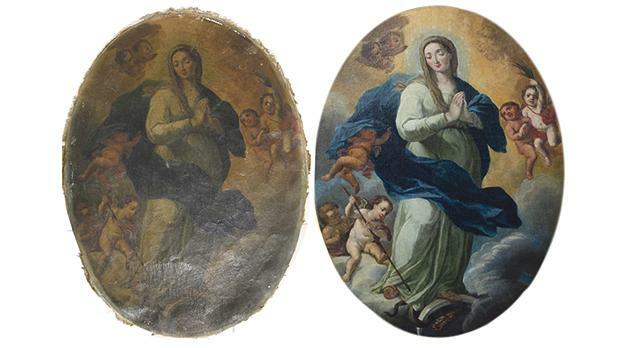 The painting of the Immaculate Conception before and after restoration. Three historic paintings at the Archbishop’s Curia that have been restored and conserved will be inaugurated at an event being held this evening at the same venue at 6.30pm. The three 18th-century paintings portray the images of the Immaculate Conception, Our Lady of the Rosary with Dominican saints, and the Eternal Father. During the event, art historian Theresa Vella will give a critical appreciation of the paintings, while the painting conservators, Valentina Lupo and Maria Grazia Zenzani of Atelier del Restauro, will give a presentation of the restoration work carried out last year. The restoration and conservation project was carried out with the support of APS Bank. The inauguration of the restored paintings will take place at the Archbishop’s Curia, Floriana, today at 6.30pm. The public is invited to attend.